Kids swim shorts with contrasting side panel. The shorts are made from excellent Chlorine resistant fabric which is cool, soft, durable and quick drying with maximum sun protection rating - UPF50+ which blocks > 97.5% of the suns UV radiation giving excellent UV protection - Comfortable to wear, excellent stretch and recovery - retains colour and shape . Matching rash shirt and cap available (extra cost). 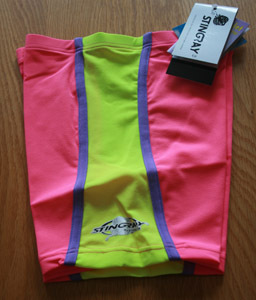 Great for swimming or outdoor activities.